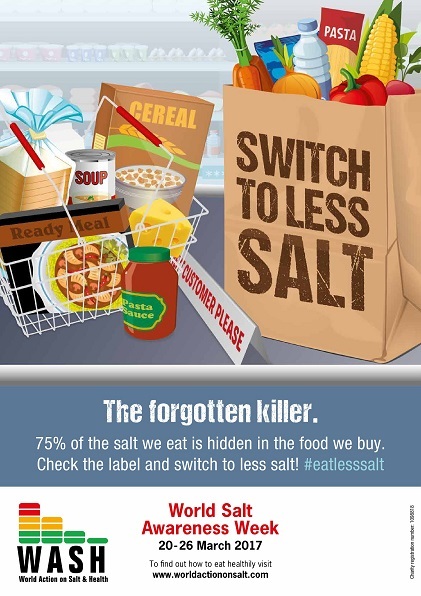 Although many countries around the world are now engaged in salt reduction activities, progress has been slow. It is now looking increasingly likely that most WHO member states will not meet their target of reducing population salt intake by 30% in time for the 2025 deadline. Therefore, over the week we will be reminding people that salt raises blood pressure, leading to strokes and heart attacks, and that by simply eating less we can lower our chances of dying prematurely. We will be emphasising the need for further work if we are to reach the World Health Organisation 5g per day salt target. Many foods still have salt added to them, even foods that don't necessarily taste salty. However, through continued collaboration with the government and food industry, and increased awareness and education to the public, we can reduce salt intake, improve population diet, reduce premature deaths and substantially reduce health care costs.